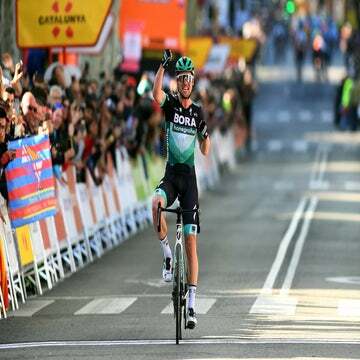 Wout Poels redeems Sky with a big solo victory in Volta a Catalunya's stage 5. Nairo Quintana keeps his overall lead. Team Sky has had precious few results so far in the mountainous Volta a Catalunya, but Wout Poels delivered a classy solo victory Friday in Valls, Spain. Stage 5 was a day for the breakaway, despite a fast first hour of racing and a downhill run to the finish. Poels attacked on the day’s final categorized climb and rode alone to victory after 175.8km. 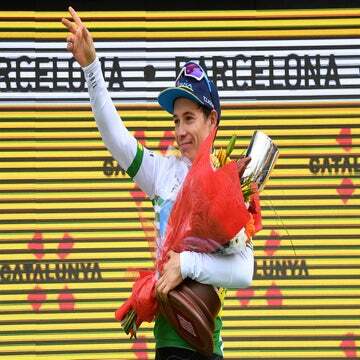 Movistar’s Nairo Quintana kept the GC lead he earned on Thursday. With 15 kilometers left, the break had a gap of a little more than two minutes. The escapees were: Kanstantsin Siutsou and Wout Poels (Sky), Carlos Verona (Etixx – Quick-Step), Dario Cataldo (Astana), Tosh Van der Sande (Lotto – Soudal), Jan Polanc (Lampre – Merida), Gaetan Bille and Frederik Veuchelen (Wanty – Groupe Gobert). Poels attacked the break on the final climb, the Cat. 2 Alt de Lila, and drove home to a solo victory. “I was a little bit nervous, especially in the last two kilometers they came really close. I think I always look behind me a little bit too much, but it was okay in the end,” he said. Behind, four survivors of the breakaway fought for minor placings. Cataldo was second, and Bille rounded out the podium. Though the GC standings didn’t change, Tinkoff’s Alberto Contador was on the hunt for bonus seconds and succeeded in clipping Quintana’s lead from eight to seven seconds thanks to an early sprint. Saturday’s stage 6 is likely the final chance for Catalunya’s sprinters, a 197.2km race from Sant Joan Despi to Vilanova i la Geltru with only two categorized climbs, a Cat. 3 and a Cat. 2.